What is Microfiber? Since you can buy microfiber cleaning cloths for as little as one dollar at your local dollar store, or as much as between $20-$40 from a home party representative - this is a perfectly understandable and legitimate question. Technically, microfiber is any fiber that is smaller than 1 denier, or 1/6 the diameter of a human hair. These tiny fibers make very high quality fabrics that can be woven, felted or knitted in different ways for many different purposes: curtains, upholstery, clothing, cleaning tools, and industrial filters. In general, microfiber can only be made from synthetic fibers - polyester, sometimes bended with polyamide (nylon). For our purposes, I am going to answer "what is microfiber?" with respect to the microfiber cleaning cloths that are appearing all over the place. What is Microfiber and Why is it Different from my Trusty Cotton Cleaning Rag? The trusty cleaning rags that most of us have used until now are made with smooth natural or synthetic fibers. That means that although they are able to pick up dirt and liquids from hard surfaces, they also leave a fair bit behind. Split microfibers are divided into thousands or even millions of tiny hooks and hairs that dislodge even the tiniest pathogens, and 'take them away'. Highly absorbent, Microfiber can absorb 6-8 times it's own weight in liquids too! The Sham-Wow is made from a low quality unsplit microfiber that is great at absorbing liquids, but I wouldn't want to be using it to clean anything! This diagram gives you an idea of how it works. 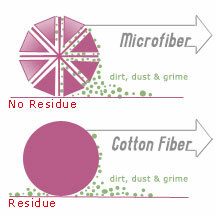 The top fiber is a cross-section of a split microfiber. See how it absorbs the liquid, dirt and pathogens represented by the tiny black dots. The bottom fiber is a regular smooth cotton fiber, soft to the touch, but it leaves alot behind - and in that mix of stuff left behind is some dirt, some water, some chemical, and some pathogens. The better the microfiber quality, the more divisions there are to hold on to the liquid and everything in it, and the smaller the particles it can gather - up to and including e coli bacteria and the common cold virus. Only Buy The Best for You and Your Family! It is always wise to buy they best quality of any item that you can afford. I am really excited to be able to recommend Norwex microfiber and other household products to help you improve your quality of life by reducing your exposure (and that of your precious family) to unnecessary household chemicals. Back to House Cleaning from What is Microfiber?